There is a fascinating phenomenon that one observes in the Kruger Park and Marloth Park during this time of year. I would never have believed it unless I witnessed it myself. It is uncanny and extraordinary at the same time. It is an evolutionary masterpiece, where the benefits are obvious but the mechanism is rather puzzling. Littered all over the place are what seem to be long pieces of grey rope. Some are in uniform lines, others form elaborate two dimensional shapes. Upon closer inspection you notice that the piece of rope is etching its’ way across the road. 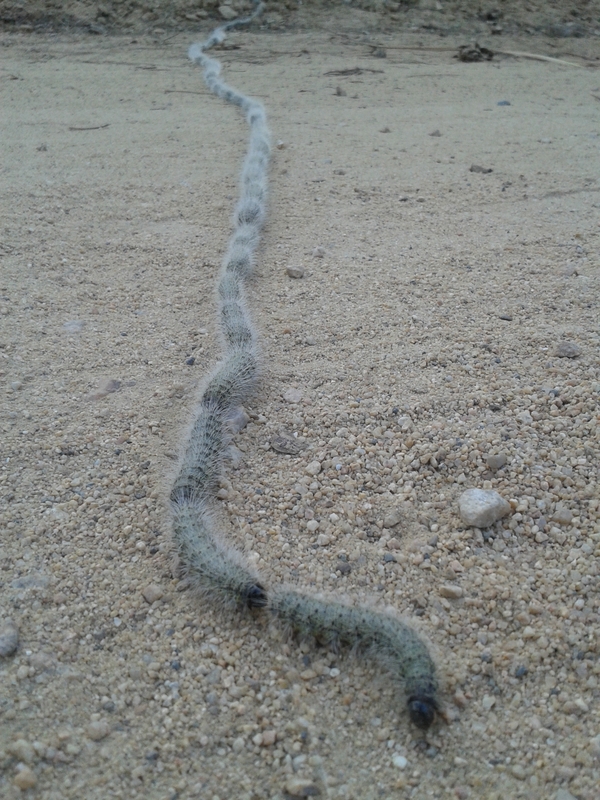 The rope consists of small grey caterpillars that follow one another in lines that stretch several metres over roads, around trees and over obstacles like car tyres. Their similarity to inanimate objects like rope and sticks, as well as their striking resemblance to smaller snakes makes them less likely to be eaten by predators. One could just imagine what would happen if caterpillar eating birds wised up to this charade. It would be an eat-all-you-can buffet where the food is served on a living conveyer belt. As uncanny as this is, one could draw similarities to human society. I liken this long grey line of caterpillars to congested roads and highways, where vehicles sit bumper to bumper on route to and from places of employment. We don’t have to worry about predators in quite the same way, we do however find ourselves doing this to make some sort of living. In fact chances are, our fellow caterpillars (motorists) find our presence inconvenient and often go to great lengths to inform us of this. The caterpillar has grand ambitions to turn into a flying insect and take to the skies, whereas our ambitions include such things as pay increases, career advancement and material gains. Our invertebrate subjects fly off into the sunset following their cycle, and yet we never make it to our cocoons. Our procession is a lifelong one filled with many trials and tribulations. There is something especially novel about treating yourself to restaurant quality meals in a quaint setting. This has been and always will be a great outing for friends and families alike. Restaurateurs are finding that their clientele consists of several quasi food critics, pondering over the presentation, taste and seasoning. With all the recent hype surrounding televisions shows like Masterchef and Come Dine With Me, people have really taken to appreciating good quality ingredients cooked in a special way. You are finding people in their kitchens working on crème brulee with their blow torches, whilst their rather sceptical partners stand by with the Fire Department on speed dial and a fire extinguisher in the doorway. It is definitely a sign of progress when you see the high power executives on the fairway swopping recipes for red velvet cupcakes and debating the correct manner in which to poach a pear in red wine. This brings us to another interesting development. The value of kitchen utensils for the new class of home chef has exploded, with knives from Germany, food processors that cost the same as second hand cars, and not to mention the various cooking vessels with their celebrity chef endorsements. The commercial value of all of this is quite evident. It has however made cooking and baking more social and fun. Going to visit friends for a meal is not quite the same anymore. Now you get to sample some household signature dishes. Prepared with love and enthusiasm. In the end one of the biggest benefits this has for society is the influence it has over sharing a meal together. People have done away with this rather intrinsic daily routine. Thankfully we are now starting to develop a wholesome appreciation for what we consume, and where it comes from and how it is made. I am on my way home now to don my apron. Until my skills are more refined and my food is more palatable, I will do another important, albeit less glamorous duty, the dishes! On a recent trip to Skukuza in the Kruger National Park we were lucky enough to come across a pair of ground hornbills. Possibly one of the strangest looking birds around. Eyelashes and red skin on a black background make for a nice contrast. They have very distinctive calls “oomph oooomph” and are always a treat to observe in the wild.